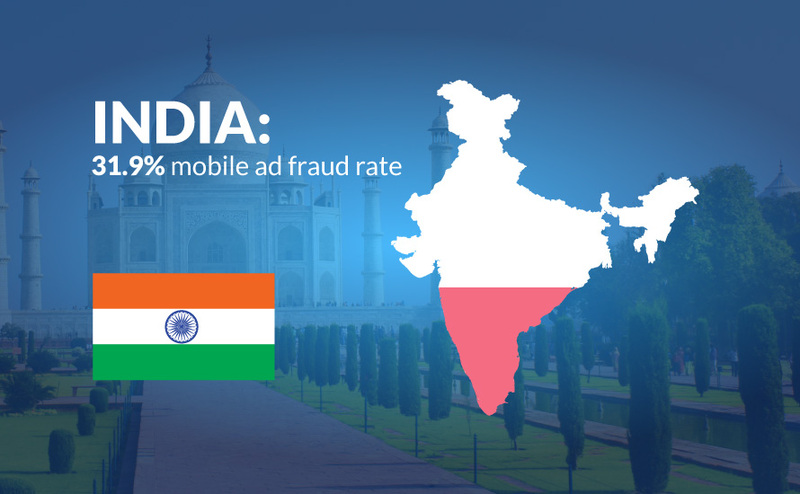 Click fraud in India is 2.4X worse than the global average, according to a recent study of mobile ad fraud. And mobile app install fraud is 1.7X higher. I studied 24.3 billion clicks on 702 ad networks, plus 437 million mobile app installs in 131 countries. Globally, click fraud across all those ad networks is 15.17%. Eight ad networks are 100% fraud, and 35 ad networks are 50% or greater. In terms of mobile app installs, 10% are clearly fraudulent. Recently, TUNE’s India team asked me to look at fraud in India specifically. So we re-crunched the numbers to focus specifically on networks that are either from India or do a significant amount of business in India. And then we focused specifically on mobile app installs in India to see how fraud here compares to the world at large. And yet, we see many partners continuing to succeed in India despite the challenges, thanks to their participation in the fastest-growing mobile ecosystem on the planet. Smart mobile publishers know how to protect themselves from fraud, and we outline some of those methods and capabilities in this report. As mentioned above, global mobile ad fraud averages just over 15%. But the global number includes India, of course. If we subtract Indian ad networks and foreign ad networks that do a significant amount of business in India, global ad fraud dips somewhat to 13.6%. But checking ad networks with significant business in India shows that ad fraud in the Indian subcontinent is much higher: 31.9%. This means that not only is Indian ad fraud about 50% higher than the global average, India ad fraud is 2.4X as high as the rest of the world. That’s clicks. What about mobile app installs? TUNE’s data scientists checked a sample size of 437 million mobile app installs from January to May 2017, which includes app installs from 131 countries. 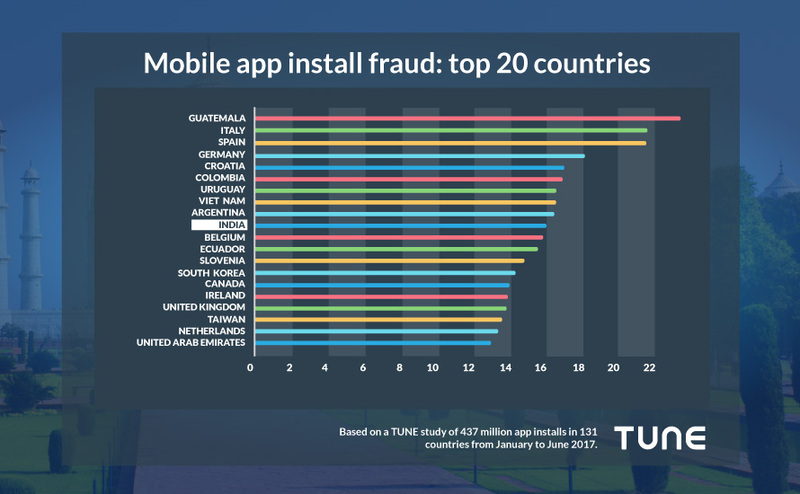 The country with the highest degree of mobile app install fraud is Guatemala, where 23.65% of all app installs showed signs of fraud (sample size: 497,652 installs). One of the countries with the lowest was Poland, with only 1.57% fraud on a sample size of 921,653. India is one of the most active countries on the planet for mobile app installs, and our sample size for the country was massive: more than 100 million installs. Unfortunately, 16.2% of them show unmistakable signs of fraud. Globally, marketers lost over $7 billion (U.S. dollars) to ad fraud last year. This year, Adloox estimates that ad fraud will more than double, costing advertisers over $16 billion. India is clearly the growth engine of the world in mobile today and for the foreseeable future. Indians downloaded more apps than Americans in 2016 with a massive 71% growth over 2015. The global association of mobile carriers, the GSMA, says that India will lead the world in smartphone adoption between now and 2020, adding 350 million net new smartphones. And TUNE’s own data shows that Indian mobile gaming revenue will double by 2019. But digital media spending is taking some time to catch up. eMarketer estimates that digital ad spend will grow about 12% this year and hit $1.2 billion in India, which still only accounts for 14.3% of total media spend in the country. Almost all of that digital ad spending will be on mobile, because India is a mobile-first country. Or, more accurately, a mobile-only country. 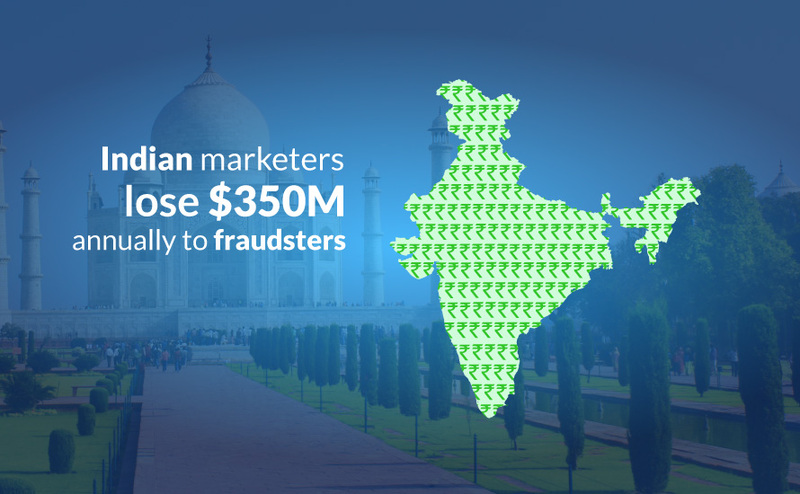 At $1.2 billion in digital ad spend, Indian marketers are handing $350 million of their hard-earned marketing dollars to fraudsters. 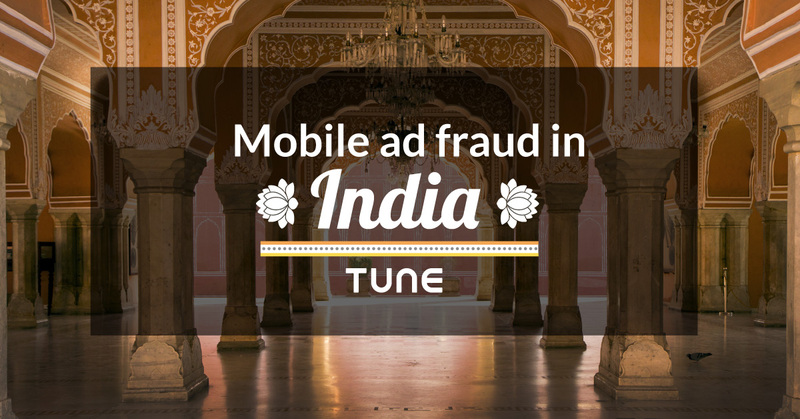 Mobile ad fraud in India: What are we talking about? Ad fraud exists in many different forms. In India, mobile app install fraud has become a major problem, thanks in part to the region’s massive smartphone explosion, app publishers’ desire to grow quickly, and fraudsters who are gaming the system. There are three basic types of app install fraud. First, there’s click fraud, where a smartphone owner downloads and installs a real app on a real smartphone, but a scammer fraudulently takes credit for the install. Sometimes called click stuffing or click spamming, it occurs when scammers fire off fake clicks from non-existent or invisible mobile ads, increasing their chances of being seen by marketers as the source of an install. Or, scammers invent completely artificial clicks that are sent server-to-server to mobile measurement platforms, again hoping to take credit for app installs that happened naturally and normally. There’s also install fraud, where the click is fake, similar to above, but the app install is fake as well. This could be an install farm, a place with hundreds or thousands of mobile devices operated by software or people who repeatedly install apps to claim advertising credit, or it could be an entirely software-based business. And finally, there’s compliance fraud: the click is genuine and the user is real, but it’s the wrong user geography/profile/etc. In other words, a marketer paid for app installs in Delhi, but gets app users in Goa. In addition, there are multiple kinds of non-app-install mobile ad fraud. In viewability fraud, for example, real ads are “served” to real people, but they might be stacked so only one is visible, even though the scammer reports that 10 or 50 were seen. Or they might be positioned off-screen. In targeting and compliance fraud in display advertising, the fraudsters serve ads to real people, but not the audience a marketer wants. This is very similar to compliance fraud in mobile app installs, of course. And then there’s bot fraud, in which scammers serve ads to bots or software agents, not real people. The bots may or may not click (tap) on the ads. In all these kinds of fraud, real marketers are spending real money for fake marketing, and scammers are profiting. “I’ve been involved in the ad tech industry for over 6 years now. Specifically to my experience at Mobikwik, I sensed a huge amount of fraud when I initiated queries around click to install times and LTV of users coming in from specific network. India is an exploding market for mobile. The country is adding new smartphone owners faster than any other market on the planet. That means entrepreneurs need to move fast to capture new market share. Venture capitalists who are funding startups see the opportunity too, and pumped $9 billion into Indian startups in 2015. While that number declined to $4 billion last year as the Indian startup scene got a harsh dose of reality — costs matter, profit matters, and free money doesn’t last forever — there is still a lot of money in marketers’ pockets to move the market. With investment comes pressure to grow. That pressure makes marketers move quickly, and impatient money is not necessarily smart money. Therefore, with increased advertising, scammers see opportunities. Essentially, India is the wild, wild East right now. But it’s not just about India. 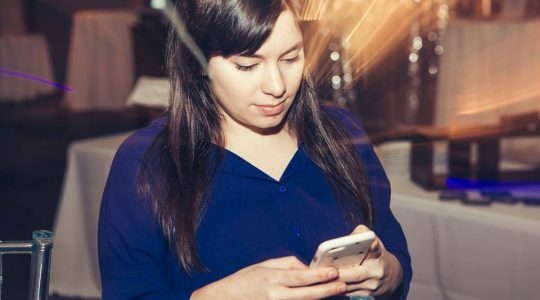 Mobile marketing is hard at the best of times because the mobile advertising ecosystem is extremely complex, obscure, and layered. The problem is largely a function of how ad networks work with each other, and with publishers. The end result in some cases is poor-quality clicks, app installs, or views. In others, straight up fraud. Marketers can take charge of their ad spend and limit fraud by paying close attention to bottom-funnel metrics, instead of top-funnel metrics. Metrics at the top of the funnel include clicks, views, and installs. These are easy for scammers to game. Metrics at the bottom of the funnel include sales, sign-ups, and long-term engagement with an app or service. Those are much more challenging to fake, if not impossible. In addition, marketers need to use an attribution product — like TUNE’s Attribution Analytics — because it will not only tell them what marketing is working and what isn’t, it will also filter fraud. TUNE’s does that better than any other on the market, thanks to deep visibility into the sources of ad network traffic — even after re-brokering. If you discover fraud, or something that looks very much like fraud, you can use these insights to have data-driven conversations with your ad partners. That’s critical, because an ad network could be delivering some very good traffic along with some very bad. Killing the bad while keeping the good could be a good option in many cases. 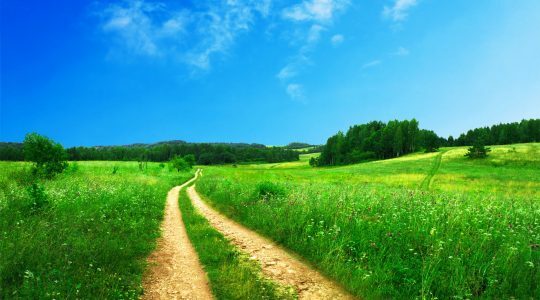 As we saw above, thanks to re-brokering ad networks often don’t know, in real time, exactly how they are fulfilling a marketer’s advertising requests. But it is ad networks’ responsibility to deliver quality fraud-free ad impressions. The challenge is simplifying the complexity, and making the right data actionable quickly. 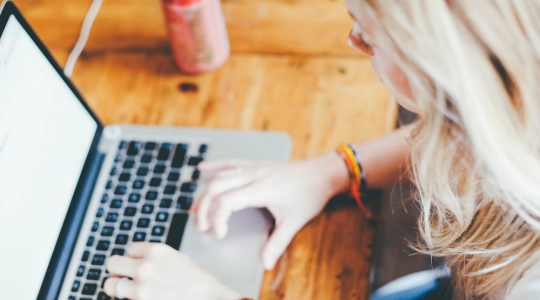 Ultimately, marketers and ad networks have a similar goal: fraud-free advertising. By looking at the same data together, cooperatively, they can actually achieve that. TUNE’s new fraud analysis tools enable that discussion, forming a foundation for both marketers who can trust but verify what their ad partners deliver, and ad networks who can wash their own dirty laundry essentially in real time. The result is cutting off the oxygen supply for fraudsters and illegitimate publishers. And the result is more money for marketers to focus on their core mission: engaging existing clients, and attracting new customers. You can get this full report in PDF form for free, right here. TUNE measures mobile, web, and smart device marketing campaigns for clients across the globe. For this study, we took a slice of data from the first three months of 2017: 24.3 billion global clicks on 702 ad networks, plus 437 million mobile app installs in 131 countries.